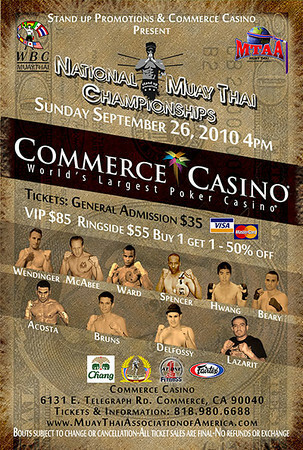 As September 26th draws closer, details have been fleshed out a bit more fully for the MTAA National Championships Muay Thai card. 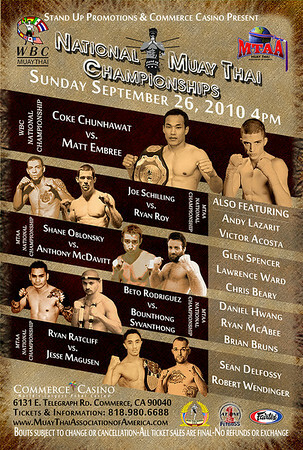 Phanuwat ‘Sugar Cane Coke’ Chunhawat will be fighting Siam No.1’s Matt Embree of Toronto, Canada. Coke has amassed an amazing 250+ fight record and once was under the tutelage of Fairtex’s famed wooden man himself Jongsanan Fairtex. Coke was ranked as high as #2 in Lumpinee and yes actually fought and defeated Buakaw Por Pramuk in the past. At stake is the WBC Muay Thai National title. I haven’t sorted out quite how WBC Muay Thai is making this a national strap that Coke and Embree will be fighting for since Matt is a Toronto, Canada resident. I am assuming this one will be at 135lbs or super light weight. Matt himself is pretty decorated with IFMA gold from 2007 and quite a bit of experience spent in Thailand including the Por Pramuk camp. In an earlier post I noted Matt being relatively tall at 5’10” for this weight class and has been as low in weight as 125lbs. Keeping with the theme of tall guys at their weight the yard’s Joe Schilling at 6’3″ from the Yard (Los Angeles) will fight Ryan Roy of Fairtex with the pro MTAA National Championship staked. I am assuming this going to be fought at super welterweight or 154lbs. ~ by fatsoking on September 7, 2010.